We will explore Temples, Ashrams and Saints following the footsteps of Lord Krishna. We will guide with local friends, contributing with stories of the Lila, personal insights and of course ongoing Kirtan. This will be a special celebration and unique experience, coming to the roots of Bhakti Yoga and leading to the gates of the Himalayas – two of the most sacred places on earth: the Yamuna River with the Braj Area and Rishikesh on holy Mother Ganga. I am thrilled to be co-facilitating a retreat/pilgrimage to India Feb 11-24. 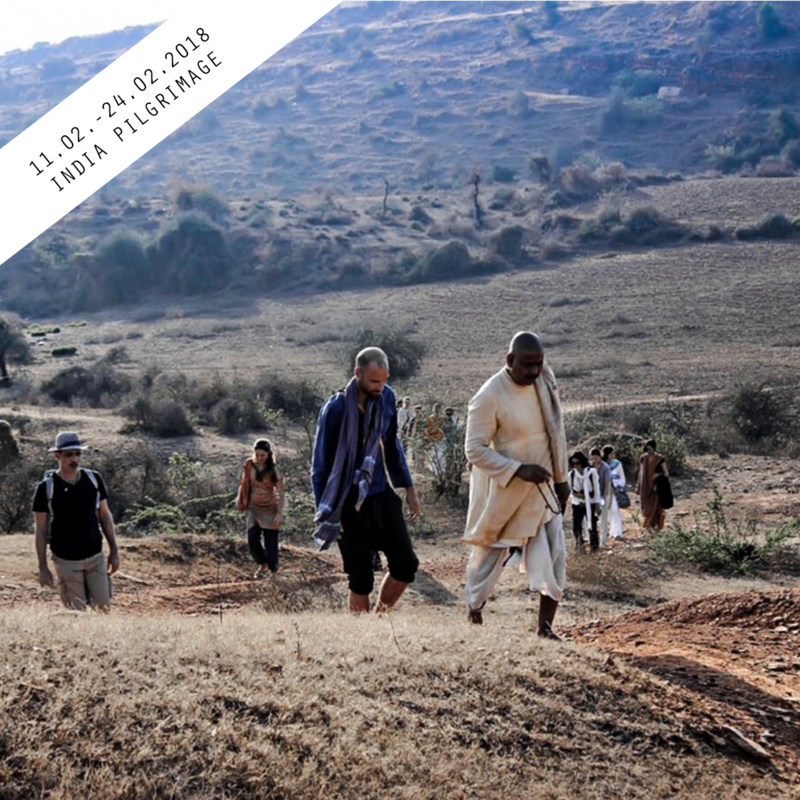 The special aspect of this retreat is that we will be spending 10 days exploring the Holy Land of Vraja, including Vrindavan and Govardhan, the playgrounds of Krishna and Radha. I spent many years of my youth practicing Bhakti and learning from teachers in this sacred land. My father brought me on a one-month walking/ barefoot pilgrimage around Vraj (Vraja Mandala Parikrama) when I was 5 years old. Since then I have been blessed to undertake that same pilgrimage over 9 times. I feel honored to be able to share the sacred stories and moods of these places with the retreat participants. We will dive deep into the essence of these mystical portals to the spiritual realm through discussion, singing and association with the saints that still walk amongst us in these holy lands. We also expect to have many bhakti teachers and musicians join us, as we ourselves also want the uplifting association. We will spend the last few days relaxing on the banks of the Ganga in Rishikesh, at the foothills of the Himalayas. This will allow for a time of deep connection and contemplation. Departure Day: we recommend a domestic flight from Dehradrun Airport (Rishikesh) on the 24th February back to Delhi. Vrindavan: Shopping at the Loi Bazaar, Raman Reti, Bhelvan, Shri Jamuna, Temple Visits, day trip to Gokul, boat ride Jamunar Arti. Ya can be understood as the movement of spreading outwards which is similar to going on a journey while Tra expresses a feeling of (an internal) recollection, or re-assembly after the outgoing movement. A Yatra is a pilgrimage to places outside and within that help us experience our path in a way that supports our holistic growth, insight and spiritual renewal. These external places are mostly temples and rivers while the inside journey is inspired through specific timing and meeting with beings of great wisdom, who know of our internal mapping. There are spots where the divine is intuitively present and experienced. Every day, huge numbers of Yatris (pilgrims) visit these sacred places to have “Darshan” of their favourite gods or goddesses. Darshan derives from the Sanskrit verb “drs”that means: to see. So they are seeking to see the divine but also to be seen by the deity. It brings them spiritual renewal as for example taking a bath in the holy river Ganga. The ancient “Puranas” of India are large literal volumes containing stories of the makings of the universe as well as fascinating tales of innumerable gods and goddesses. The geography of the Puranas coincides with that of the entire Indian sub-continent. Countless places mentioned in these ancient texts are alive today and are important places of yatra (pilgrimage). Brij Vasundhara spread at the feet of the sacred Govardhan Parvat (Hill) redefines luxury in this divine land. Idyllically located at the basis of the pious Govardhan Parikrama, this spectacular resort brings you closer to the God. Amongst the exhilarating view of the panoramic Govardhan hill and echoes of chants and hymns in the air, these luxury cottages provide a heavenly experience taking you away from the world once you step in. The quality of service and the aura of the hotel promise an unparalleled stay while the tastefully landscaped green areas will definitely soothe your senses. Each cottage opens into its mini private tastefully landscaped green space, the glass facade of the fourth wall ensures a unique blend of nature and grandeur. The two spacious yet cozy bedrooms along with the living room bring out the best of nature -come and indulge yourself in the warmth of the morning sun, ponder all through the noon, and soothe your nerves as the evening breeze gently caresses you. The serenity will be a bliss to the nature enthusiasts while modern amenities will ensure a hassle-free stay for you. Ananda Krishna Van features apartments with a kitchenette and free private parking. Located in Vrindavan, known for its many sacred temples, the property is 400 m from Prem Mandir (Temple of Love). In the Samrahasyopanishad, Lord Vishnu says, “Hey Laxmi! Listen, the greatness of Vrindavan is so that I am unable to describe it. Only those who make a special effort to visit Mathura and Vrindavan can feel the vastness of this ananda”. The Lord’s intense love for Vrindavan has made it the centre for Krishna Bhakti. It is in this ambience of the faithful that Ananda Krishna Van fulfills the desire of Lord Krishna by offering the best of services to the Lords devotees in Vrindavan. Tucked away on the foothills of the Himalayas,Divine Ganga cottage is located in the country’s most beautiful Northern region Rishikesh,Known for its peaceful environment & breathtaking breeze .This property overlooks the enchanting Ganga as it meanders through the majestic Himalayan mountains.It is walking distance from Famous bridge,Lakshman Jhula enroute to the shrine of Badrinath and Kedarnath. Every room opens out onto a large airy balcony, where one can sip away a cup of hot lemon-ginger tea while enjoying the breeze of the Ganges. Starting at the age of 5, Vish has spent his life leading Kirtans in the ISKCON (Vaisnava) tradition. He is a multi-instrumentalist, and a master of the Mridanga drum and performs in traditional as well as fusion styles. 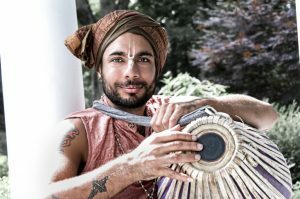 Vish started performing in the modern yoga studio culture 2009, and since then he has performed at countless studio gatherings and well known spiritual venues like BhaktiFest and Omega Institute. Vish is the lead singer of the internationally acclaimed group ‘The Mayapuris’, a headlining Kirtan group that has rocked stages from India to Florida, Australia to South Africa. He also sings and plays percussion with ‚The Hanumen‘. In addition to being a master percussionist, Vish also sings, and plays harmonium and bansuri flute. Vish is an in-demand sideman as well, and has toured with Kirtan pioneer Jai Uttal. Vish has not only mastered his art but has a rare capacity to invoke the ‘rasa’ of the essence do the transcendental energies that define the Kirtan path.